During the sweltering heat of July 2006, the mystic tribe of the Ancient Bongoliers met at the Blackland Lakes campsite in Wiltshire to visit the ancient monuments of Avebury stone circle, Silbury Hill, and West Kennet Long Barrow. But nobody had brought any waterproof clothing with them. It really was hot! Local chaps Tim Preece and Leo Stevens ferried us to our starting point in Avebury village, and as soon as we set off it was immediately apparant that everyone was going to struggle to do the full walk. But everyone managed to trot round the stone circle and see its unique setting. 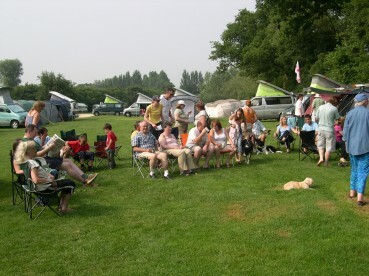 The party that set off for the 2 mile walk to Silbury Hill consisted of 10 hardy souls. The rest of the party retired to the Red Lion for an early lunch. Silbury Hill is the largest man made eart-structure in Europe, and quite possibly the world. It is 130 feet high and was constructed about 3,000 BC. It would have taken a labour force of 1,000 Irish navies 8 years to complete. If the contract would have been given to the same firm responsible for the building of Wembley Stadium, it would have taken 320 management consultants 25 years to build! Suddenly, as if from nowhere, a huge anvil shaped cloud headed ominously across the downs. It was heading straight for us. We made a dash for the sanctuary of the West Kennet Long Barrow on the nearby hill, but we only got half way there before the storm hit. We were all soaked to the skin. Unfortunately none of us thought to get our cameras out as were too busy dodging the bolts of lightning and cowering from the thunderclaps. But here’s one of West Kennet that I took earlier. Once the storm had passed, we made a bolt back to the car park at Avebury, and then back to the campsite. As we drove in to our paddock, we were presented with a scene of huge devastation! At least 2 awnings (one belonging to the Bongomaster! and the other having been pegged out by the Bongomaster!) had collapsed, and a number of items of clothing had fallen in to a puddle! Again, although no photos survived the tremendous storm, the picture below gives some indication of the mind-boggling horror! We were, clearly, lucky to survive, so we all went out for a slap up meal and a few pints (or a lot of pints in John Garner’s case) at the Talbot. Here’s to the next (dis) organised event!